. : Optics & Photonics Focus :: Honey, I Shrunk the Microscope! :. Super contact lenses which display background information onto your real world view seem like a gadget taken from the latest Spielberg movie. Thanks to a recently developed technique, this scenario may soon be real. The size of a US quarter. An exemplar of the new microscope developed at Caltech. In the picture, the comparison between the microscope and a US quarter can be seen. So many things can actually fit in your pocket: your wallet, your cell-phone, your keys, and… your microscope the size of a US quarter! This is the scenario that the group led by Changhuei Yang at California Institute of Technology (Caltech, Pasadena, California) envisions. If the specimen cannot be brought to the microscope, the microscope must be brought to the specimen: this would be the modern day analogy of the old saying about Mohamed and the Mountain. The simplest microscope imaginable requires a light source, a sample, and a pair of lenses. Its working principle is simple: the objective lens collects the light coming from small objects, such as cells or dust mites, and the eyepiece lens focuses this light onto the observer’s eyes. It is as simple as that! The magnification of the microscope depends on how much each lens stretches the light: a 100x magnification, for instance, means that the image at the eyepiece is 100 times larger than the real object. "It is interesting to note that the basic microscope design has not changed by much since its invention a few hundred years ago," Yang remarks. "It is true that we have better optical elements nowadays and that the image quality has improved by far, but the imaging strategy has not changed much. If we survey the microscopes that are in broad usage nowadays, we will find that the basic microscope still dominates. However, whether we like it or not, cost is a major issue." Indeed, the cost of a typical commercial microscope ranges from tens-, to hundreds-, of thousands of dollars. "Our primary objective," Yang adds, "is to lower the cost of microscopes by at least two orders of magnitude. In this research project, we very quickly realized that we needed to eliminate lenses and other optical elements from our design if we wanted to achieve cost-effectiveness." A microscope is literally anything that can be used to see small things, smaller than what the naked eye can see. Indeed, mikrós means small in ancient Greek and skopéin means to see: no lens is involved in this definition, but what might we use instead of lenses? In 2005, a direct projection method was developed to implement a compact and low cost imaging system : the image of the specimen, placed on a camera, was directly recorded by the sensors of the camera. The resolution was, therefore, limited by the pixel size of the sensor: about 3 micrometers at best in commercial CCD or CMOS cameras. Would it be possible to increase the intrinsic resolution of such cameras in order to achieve a high-resolution, yet inexpensive, microscope? This is the question that the group at Caltech tried to address. The new microscope at work. The holes on the pixels of the camera render a high-resolution image of the sample, in this case a cell, while it is scanned. The first natural step to take was to reduce the pixel size of the sensor: the smaller the pixel, the better the resolution. In this work, the effective camera pixel size was first shrunk to one micrometer in diameter by coating the pixels of a CMOS camera with a metallic grid of holes. The overall resolution, however, was still limited by the number of pixels and the separation between them in the underlying camera. In solving this problem they were inspired by Near-field Scanning Optical Microscopy (NSOM), where a nanometer-sized probe is scanned over the sample in order to collect information locally with a resolution of up to 50 nanometers. Analogously, Yang and colleagues scanned the sample over the holes on the pixels of the camera, thus rendering a final resolution of less than one micrometer. "Our microscope has a lot of similarities with a NSOM," Yang explains. 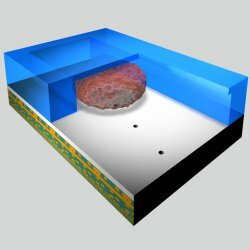 "By making the holes smaller, we can actually beat the diffraction limit that conventional microscopy imposes. This is not surprising or unusual as the key advantage of NSOM over the conventional microscope is its super-resolution. However, at that resolution our microscope, in its current implementation, will be capable of rendering very highly resolved images, mainly of the surface of the objects, similar to what the NSOM can do. We are actually hard at work on a different design that should enable us to acquire images from different focal planes," as is already done in confocal microscopy. 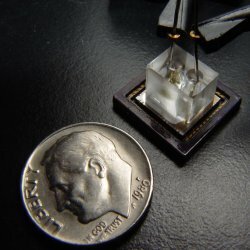 This microscope can be readily fabricated using the established techniques of semiconductor industry and thus helping to keep costs down. "The compactness and rugged nature of our microscopes are almost-unintended associated benefits," Yang adds. "Since we can build tens or hundreds of microscopes on a single chip and potentially sell the chip for as little as ten dollars, we can start thinking about linking up a large number of microscopes and operating them in serial or parallel with useful applications for high throughput cell analysis experiments, such as sorting stem cells and performing large assay drug discoveries. Furthermore, the healthcare of developing countries can benefit from low cost, disposable microscope systems for analyzing malaria or other blood parasites. We truly hope that something will become commercially available within the next 5 years." Charles A. DiMarzio at Northeastern University (Boston, Massachusetts) confirms that "this microscope is implemented using conventional fabrication techniques broadly used for electronic circuits, making its cost potentially low in a high-volume production. Low-cost and even disposable microscopes, particularly when combined with communication technology, will find uncountable applications in many fields, such as environmental sensing, and medical diagnosis in situations where conventional pathology laboratories are impractical. Such a microscope in a cell-phone could do for microscopy what the cell-phone camera has done for photography. As just one example, it could ultimately bring the hardware pathology laboratory to the patient's bedside." This microscope, therefore, could make the job of many professionals, such as doctors or biologists, easier in extreme conditions. "Despite over four centuries of improvements in microscopy, no device has been built to meet all needs," DiMarzio points out. "Scientists need a wide variety of instruments to explore an equally wide variety of phenomena that are too small to be seen by the unaided eye. This device trades some potential sensitivity and versatility for good resolution in a small and inexpensive package. Although there will always be a need for large laboratory microscopes, this invention fills a missing niche in our available array of tools." D. Lange et al., A microfluidic shadow imaging system for the study of the nematode Caenorhabditis elegans in space, Sensors Actuators B 107, 904–914 (2005). Xiquan Cui, Lap Man Lee, Xin Heng, Weiwei Zhong, Paul W. Sternberg, Demetri Psaltis, and Changhuei Yang, Lensless high-resolution on-chip optofluidic microscopes for Caenorhabditis elegans and cell imaging, PNAS (2008) 105, 10670-10675 (link).